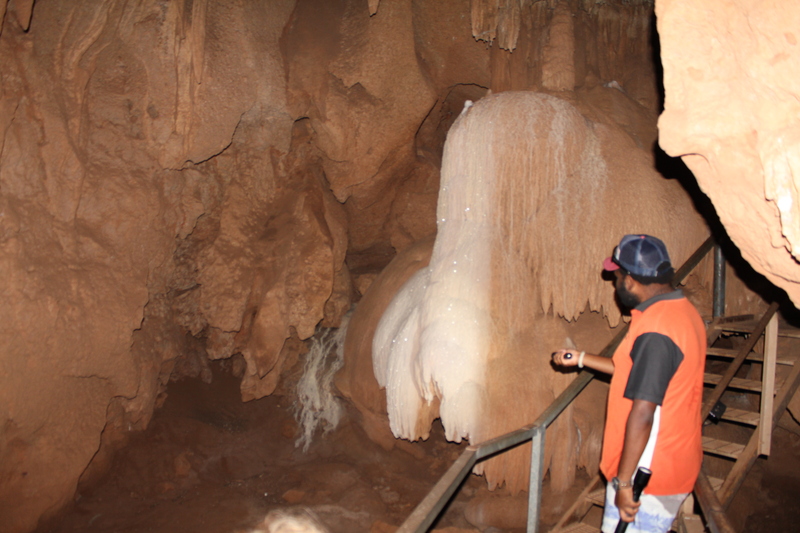 In the hope of beating the heat, we headed to the Cutta Cutta Caves for the first tour of the day. 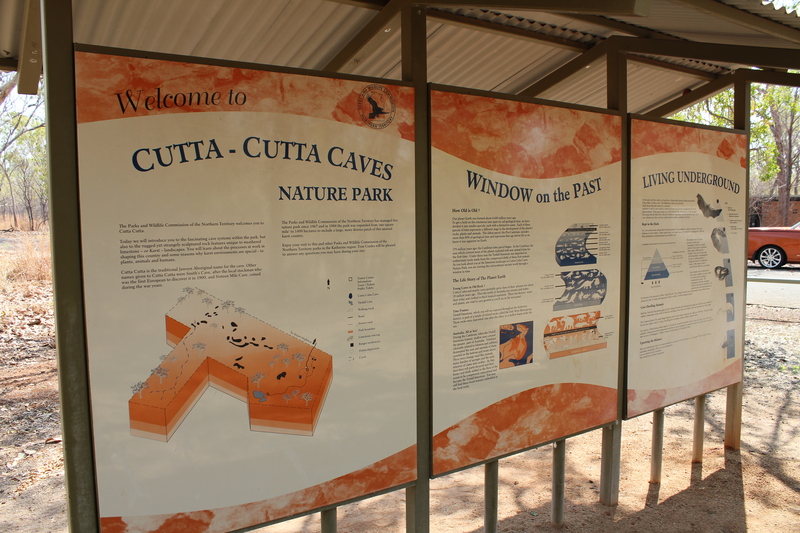 The Cutta Cutta Caves Nature Park covers 1,499 hectares of limestone (Karst) landscape – a landscape that is found in only a few locations in Northern Australia. 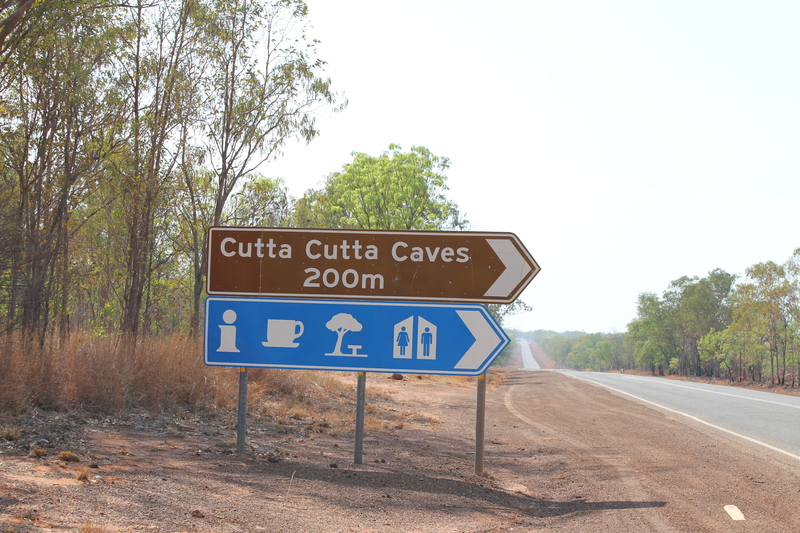 Access to the park and cave tour site is located off the Stuart Highway 30 km south of Katherine in the Northern Territory. 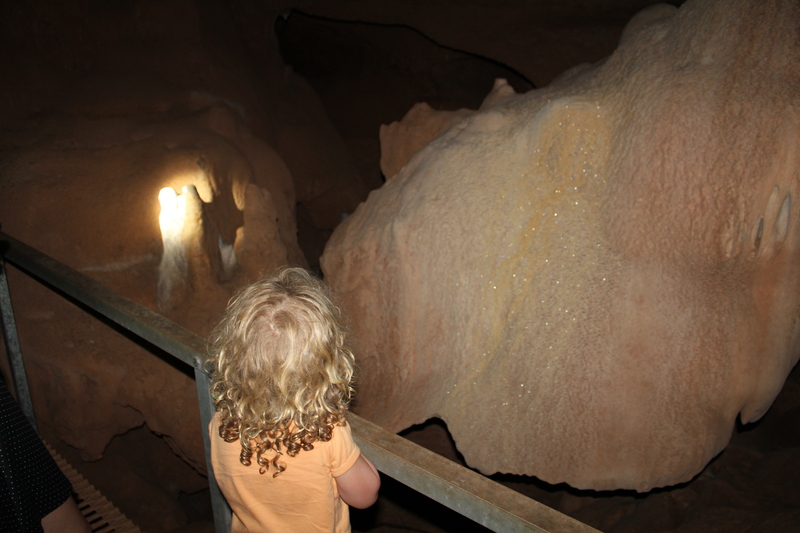 The park is open daily all year; however during the Wet Season (December to April) the caves may be closed due to flooding. They say that the most comfortable time to visit the park is between May and August, so let’s just say that October was a little, no make that… more than a little, okay… STEAMING hot! To access to the caves, you will need to join a tour that are generally run on the hour. The park kiosk sells tour tickets, refreshments and souvenirs and is home to a small collection of local artefact’s. 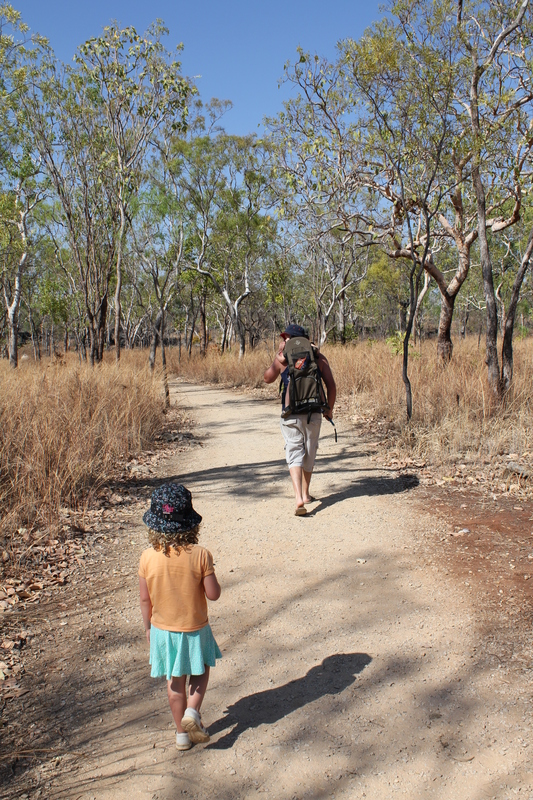 We met our guide Ethan and set off on a short, albeit hot, 365m walk to the cave entrance. Ethan gave us a safety briefing and went over the rules before we headed down the staircase into the cave. We had not gone very far before we saw some wildlife. 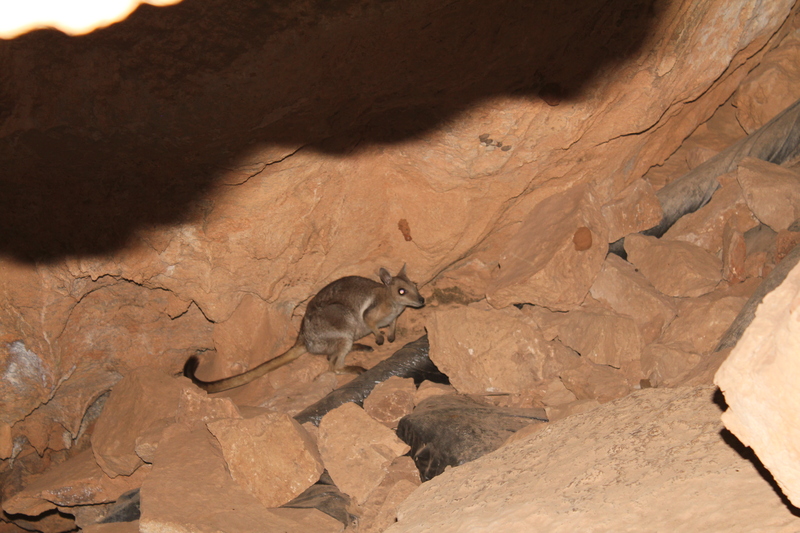 A wallaby was hiding in the shadows and approximately five red-banded tree snakes were coiled on the cave ledges making the most of the lower temperatures in the cave entrance. The deeper in we went, the lower the temperature dropped and we were able to enjoy this unique experience. 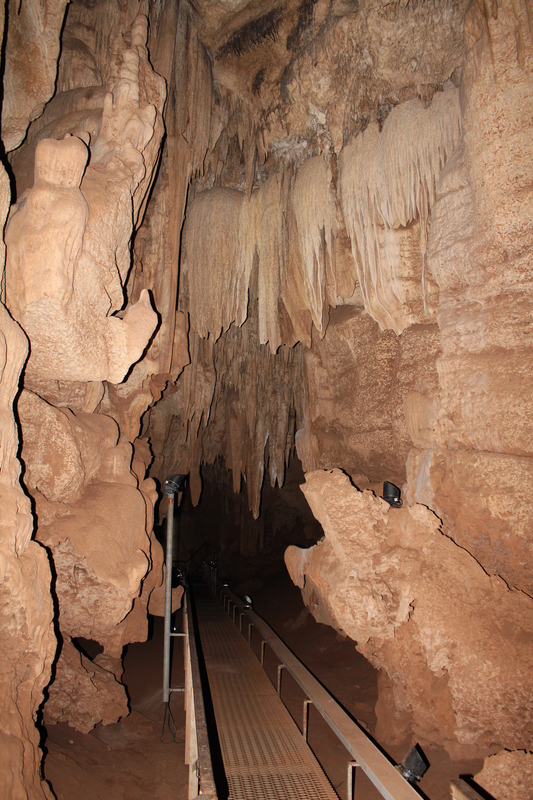 We made our way approximately 200m into the cave on specially constructed walkways looking at the different calcite formations. Ethan reminded us of the old saying that “stalactites are holding on ‘tight’ to the roof and stalagmites ‘might’ make the ceiling”. In the cave there is minimal lighting and Ethan had a torch for pointing out interesting spots. Ethan and his trusty torch! When we reached as far as we could go into the cave, Ethan switched off the lights. It was pitch, pitch dark and eerily quiet. It was also quite humid this far into the caves – so make sure you take water with you! It was so very dark with the lights switched off! Oh, to sleep here!! Ethan was a wealth of knowledge and answered all of our questions. He explained that the indigenous Jawoyn people have had a long association with the area; however there is no evidence of them ever using the caves. In terms of the history of the caves, it is believed that around 1900 a stockman by the name of Smith was moving cattle across the area and noticed he was missing some. Upon investigation he discovered the main cave entrance as this is where the cattle had fallen. 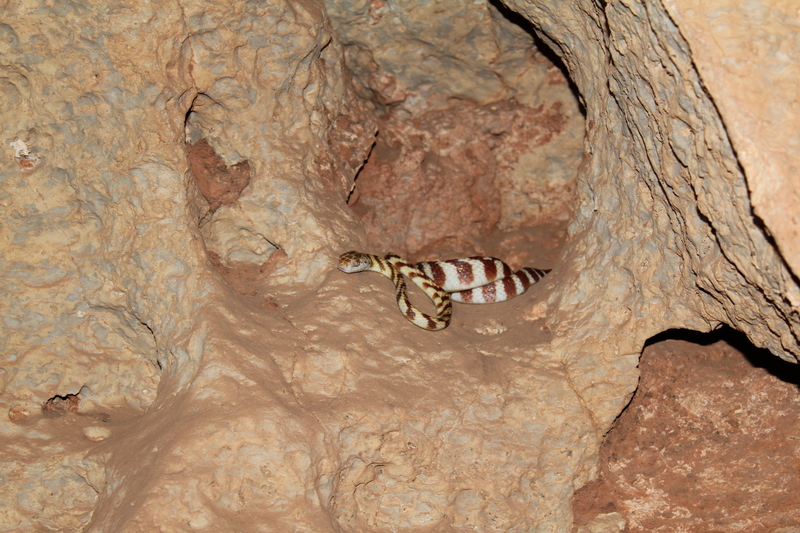 It was then named “Smith’s Cave”. The silly cows fell down the hole and the man found them and then found the cave. Maybe the cows were trying to stay cool. During World War II, serviceman used the cave and stalactite formations for rifle practice (how and why they would shoot in a dark, confined space is a mystery as is how many men were injured or killed from ricocheting bullets…) and fortunately they did not do more damage than they did. During this time, the cave was referred to as the “16 Mile Cave”. 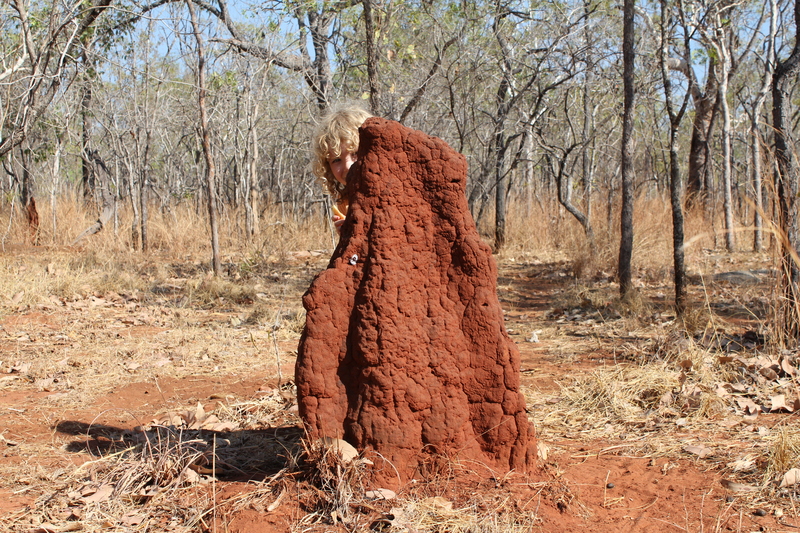 The area was handed to the Northern Territory Reserves Board (now the Parks and Wildlife Service) in 1967, and a private tourist operator began cave tours shortly afterwards. In 1979 the area was renamed Cutta Cutta Caves Nature Park. After about 40 minutes we made our way back out of the Cave, the temperature slowly rose and then we were back out into the oppressive 42c degree heat. It was then back to the kiosk for a well-earned icy pole and ice-cream! If you are still keen for a walk after (or before) the cave tour there is a Tropical Woodland walk that begins near the car park and enables visitors to experience the open tropical woodland. Days and Times: Open most of the year, 7 days a week. Closed during the wet season if it floods or is too dangerous to tour. Tour times begin at 10am. Location: Stuart Highway 30 km south of Katherine, NT. 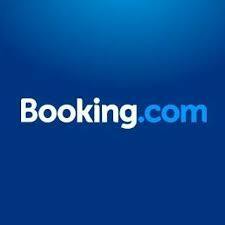 Cost: $20 per adult and $10 for children 4+.